Acting Balanced: This one is most out of my comfort zone. Heather was using her blog to promote Autism Awareness Month for April and I offered to guest post about our experience with Robbie being "on the spectrum." It's the first time I think I've really connected his name with the "a" word. Fit City Moms Blog: This is my usual monthly post for Fit City. This month, I was inspired by a Rite Aid commercial about 15 minutes and wrote about 15 minute starts to better health and fitness. I'd love it if you would come over and share your thoughts too. All Things Aging: You've been there. You end up in the grocery store line that seems to move the slowest. What if the cashier is an older person? How would you respond? Visit the post and tell us WWYD? Finally -- and I didn't write this one -- check out a special report on the Royal Wedding by my friend Sarah's 3-year-old son. Love this! It's another fragalicious Friday. Little bits and bobs, to borrow a phrase from the Brits in honor of the royal wedding, floating around in my brain. 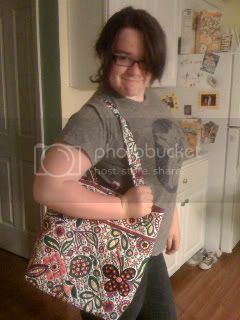 Bit: I hosting a Vera Bradley tote bag giveaway. 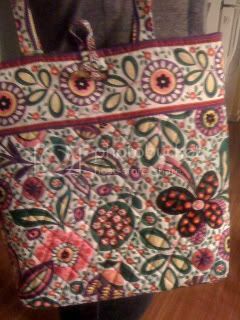 If you're a Vera fan or you just want a great bag to carry library books in, be sure to check it out. The winner will be announced on Monday. Bob: Coverage of the royal wedding of Prince William and Kate Middleton begins in just 3 hours. Maybe I should just stay up? Will you watch? Bit: Today was the last Weight Watcher meeting in this at-work series. I ended on a good note, losing 2 pounds since last week. I'm going to try to keep the momentum going. Especially after reading this inspiring guest post from Annie Weighs. Bob: Speaking of momentum, Charlie's class is having it's roller coaster exhibition in the morning. I got a sneak peek of several of the coasters -- lots of very fun ideas! Bit: Mike was uploading some videos for me tonight and was a bit frustrated because I had shot some of it sideways. He said "You are not allowed to be this technologically impaired and still be married to me." I wonder if that was an offer or an ultimatum? Bob: My blog makeover is well underway. I can't wait to get it uploaded. It's a great, fresh new look! Bit: Even more exciting than a blog makeover, Mike has a job interview next week. Prayers appreciated. Bob: Annie leaves on her 8th grade class trip on Monday. I think I might be a little verklempt sending her off and only partially because she'll be leaving me surrounded by testosterone for 5 days. Prayers appreciated for this, too. That's all the bits and bobs I've got this week. For more fragalicious Friday fun, be sure to visit Mrs. 4444s Friday Fragments post. In honor of the occasion, I thought I'd let Annie take over and tell you how she got started. Since Amy often blogs about The Biggest Loser and I write a weight-loss blog, I thought I'd keep that theme going here. Amy often writes about her weight-loss struggles so I know her readers can relate to her. Hopefully y'all can relate to me, too! I've struggled with my weight pretty much all of my adult life. I gained a little while in college, gained a little more after I got married, got A LOT more after we moved to Oklahoma (can we say emotional eater?) and then even more after having my son. My son just turned five years old. I tried the South Beach diet for about five minutes and knew it wasn't for me. No carbs?! Yeah, right. I have a great love for all things bread, pasta, pizza, cakes, cookies...etc....you get the picture. I tried Weight Watchers Online, by myself, with a little luck, but it didn't stick. Then, one day, something clicked. I had prayed about it for well over a year, and something finally just clicked. I was ready to lose weight once and for all. I don't know how to describe it, but I woke up singing that Michael Jackson song, "Man in the Mirror" and it starts out "I'm gonna make a change, for once in my life...". I was ready. Ready to make a change and I haven't looked back. It has been 12 months and as I'm writing this I've now lost 80 pounds. Crazy!!! Weight Watchers, going to the meetings, works. I'm not writing today to talk all about how much I've lost or how much I love WW (I really do, though!). I'm here to talk about that moment of readiness. So many people start "diets" and then end up giving up. Why? Because they weren't really ready. They may know that they need to lose weight, but something was holding them back before they even got started. Do you need to lose weight? What is holding you back? Think about it. I bet there are so many reasons and excuses why you're not starting today. A birthday celebration coming up, vacation, weddings, graduations, hesitation to being judged at a meeting, stress at work....whatever it is, there is always something. Yes, there is ALWAYS going to be something to hold you back. It is far too easy to give into those reasons and make up more excuses as to why you haven't started. Is there a perfect time? No. It is that simple, there is no perfect time to start a weight-loss journey. I started on April 29th, 2010. What was special about that day? When I woke up that day, there was absolutely nothing special about it. When I went to bed that night, it had become the day that was going to start the rest of my life. That was totally cheesy, I know, but it is so true! But this isn't just about the weight I've lost. More importantly, I have gained self-respect, energy, better sleep, happiness that I didn't know was missing to begin with, and a happier family because of it, and deeper faith as I fully rely on God to get my through tough times on this journey. Are you ready? Fight through those reasons and excuses, pray about it, do whatever it takes to finally get ready and that moment will come to you as long as you're open to it. Are you ready to be healthier? Are you ready to be happier? I would love to hear about your moment! Congratulations Annie! I am really so thrilled for you (and a wee bit jealous). If you want to keep following Annie's journey, be sure to visit her at www.annieweighsblog.blogspot.com. It's quiet in here. The kids are asleep. The dog is asleep. Mike is at a movie. I had the television on, but the recorded show I was watching is over. All I hear is the tapping of my fingers on the keys and the hum of electronics plugged in. I hate to sound stereotypical, but the older I get, the more I enjoy -- even crave -- this kind of quiet. If it weren't for the kids, the radio in my car might go for days without use. My kids seem to be able to filter out noise that I just can't tolerate. It's nothing for the television to be on in one room, a computer game buzzing and ringing in the next room, and a radio to be on two rooms over. It's too much for me. I like to think that I'm a pretty good multitasker, but I just can't think straight when there is so much noise competing for my attention. Earlier tonight, on the way home from church, the radio was on and the kids were bickering and chattering in the back seat. We drove past a hotel and I suddenly had this fantasy of checking into a hotel all by my lonesome for the night, just for the quiet. Sometimes I think I'd do well on one of those silent retreats -- though people who know me well, might disagree. My biggest challenge would not be the auditory silence. It would be the electronic silence. I've gotten quite good and shutting off/out the noise that hits my eardrums. But I'm not so good at shutting out the noise that bombards my eyes and my intellect. The stream of Facebook messages, the endless collection of e-mails, even short 140 character messages on Twitter can take up some pretty hefty space in my head. I don't really have a plan in place, but I do think that I'm going to try to build some more of that quiet into my days. Maybe just 10 or 15 minutes. No laptop. No phone. No circular parade of pontential blog posts rolling through my brain. Just me. And the quiet. And the hum of silence. Today was a busy day. Soccer game, church decorating, birthday party and laundry, laundry, laundry. It was so busy that by 7pm, we still hadn't colored Easter eggs or even gotten the baskets out yet. Robbie was getting a little impatient to get the festivities going, so he brought the baskets out and asked if we had Easter grass. I said, yes. "It's in a bag under my bedroom window. You can go upstairs and get it. It's by the windows." There was a small part of me that thought maybe sending him upstairs was a bad idea. But most of me wasn't really paying attention. Until...he came downstairs with the Easter Bunny's stash that was NOT under my window, but was hidden (or so I thought) in my closet. The bag of candy was mostly still sealed up. But Robbie was waving one of the Nerf guns I'd bought (because nothing says "Christ is risen" like plastic and foam warfare). "Mom! Can I have this?" Well, crud. Mike and I looked at each other and asked "now what?" I just took the discovered contraband and said "This is not for now." I was able to quick-change the subject by suggesting a family viewing of the movie "Tangled," which was really enjoyable. When it was over, at 9:30pm, we still had eggs to color. So at 10pm, Mike took the kids to bed and I headed to Target to try to undo the bunny debacle. At one point, I had Mighty Beans for Robbie, a Chewbacca t-shirt for Charlie, and a Nerf Gun for Annie in my basket. I think I circled the inside perimeter of Target at least 3 times, trying to decide what to do. I didn't really have the discretionary funds to buy new Easter gifts and the last thing we need in my house right now is more clothes. But the Nerf gun was going to have to make an appearance. So, I ended up getting the Nerf gun for Annie -- I decided not getting her one would leave her unfairly defenseless against her brothers. I opted to give Charlie the 3-pack of sugarless bubble gum I'd previously planned to split among all three of them. And a I picked up a box-tops-bearing box of fruit roll-ups (which we never buy) for Robbie. The Nerf guns will make an appearance on the mantle as a gift from Mike & me. Everything else is from the bunny. And hopefully that will be the end of that. I'm not so married to the idea of the bunny, but I do enjoy the mystique of Santa and I'm afraid that once the myth of the Easter Bunny is revealed, Santa won't be far behind. And in the instance of both holidays, the kids are very aware of the real significance of both occasions. So, Easter "crisis" averted. For now. Who knows what questions tomorrow will bring. I've got kids on the brain tonight, so I thought I'd dish up some fraggin' kids today. We've hit the home stretch of Annie's 8th grade year. Tomorrow (well, today -- in just 7 hours actually), her class will do a dramatic presentation of the Passion for Good Friday. It's really the first of the last events of 8th grade. After the Passion, there will be May Crowning, the DC trip and graduation. It's really so hard to believe that she's been there for 9 years. As I heard recently, "the days are long, but the years are short." So true. One of Annie's favorite activities of late has been to record silly, rambling videos for friends and post them on Facebook. I've watched them. Nothing harmful, just lots of random silliness. I thought it was getting to be a bit much, but she got a text from an old friend today who's had a pretty rough go of it lately. This friend told her that those videos were one of the first things the friend has laughed at in a long time. Just another testament to the power of humor and of social media. Charlie goes back to the doctor tomorrow for a check of his arm. 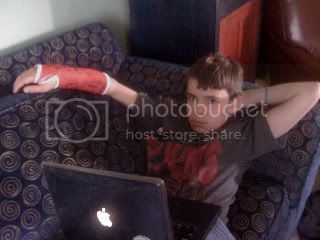 I hope they give him a new cast because the one he has on now is filthy! I swear he must roll in dirt on recess. And if a new cast is in the future, I'd be happy for it to be waterproof. 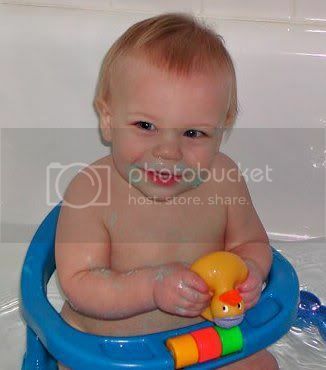 Pics of Robbie's first birthday popped up on Mike's FB page tonight. He was so little, round-faced and happy. And blonde! Who could resist this cutie? I wrote a guest post about Robbie on Acting Balanced. Not sure when it will post, but I'll let you know. It was a step out of my comfort zone, but good for me to do. 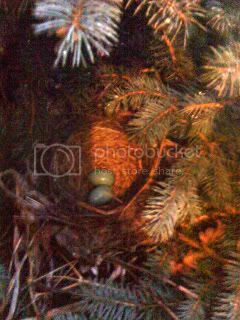 Speaking of babies -- the baby-birds-to-be are still doing well. There are four eggs in the nest now and we're trying to avoid using the front door as much as possible because a.) we don't want to disturb the nest and b.) we don't want Mama to peck our eyes out. Not specifically related to kids, but moms -- and anyone interested in healthy habits: I'd love it if you'd visit the Fit City Moms blog to read (and comment on!) my post this month -- 15 minute start to fitness. It's almost 3:30am and I'm fresh out of fragments. If you need more, be sure to visit Mrs. 4444s Half-Past Kissin' Time blog. Wishing you all a happy Easter and a wonderful weekend. In the Christian world, today is Holy Thursday, the first day of the Triduum, the three days preceding Easter Sunday. It's one of my favorite weeks of the church year. It also brings to a close the season of Lent (yeah for the return of my couch! ), a season of repentance. Which brings me to today's guest post by Rachel of The Lazy Christian. Is there something I don't want to tell my regular readers that I can put on this guest blog? I'm pretty honest on my blog, but there are always some embarrassing things that I don't want to put on there. Things I struggle with that are embarrassing to tell people I know and love, or people who look to me to have it all together. But you know what? My blog is called The Lazy Christian. I don't have it all together. That's kind of the point. It's human nature to want to hide things that embarrass us. Lousy pictures that make us look fat or show our hideous fashion choices during the 80s. Things from our past. Stories about that time we accidentally flashed our backsides during a school musical performance. Oh. Was that only me? When we become Christians, we become reborn. We get baptized and receive the Holy Spirit, and it changes who we are. It has to. If you're trying to "spruce up" your old life by adding good deeds or showing up to church, that doesn't cut it. You need a whole new life. You need to allow God to do an extreme makeover on your soul. Now, I'm not great at memorizing scripture. I didn't even know where that verse was located at the time -- just that I'd heard it or read it before. But God placed it in my head -- and in my heart -- to remind me that I'm not who I was. That lousy Rachel is gone; God has made a new Rachel. I don't have to be ashamed of that stuff anymore. It's not me. That person doesn't exist anymore. It's amazing how much sin in my life is starting to bother me. Little things I wouldn't have even considered sin before are now glaring inconsistencies in my life. Compared to who I was 10 years ago, the sin in my life now is pretty tame. Chump change, as it were. But that's God at work in me. We've changed the big things, and now he's getting picky. He's working to make me the woman he needs me to be to do what he needs me to do. And that's nothing to be embarrassed of. Tonight's post is compliments of the throbbing tooth pain I have going on right now. The tooth is broken (thanks to my compulsive ice chewing habit) and was supposed to have a root canal on February 1. Yes. Almost 3 months ago. But something happened on February 1 and I had to change the appointment. Then the ice storm hit and I canceled the appointment. Then my tooth stopped hurting and I figured I had better things to do with my $600. Since then, I've been keeping up a regular schedule of ibuprofen, which seems to hold it to a dullish roar. The tooth in question is on the upper right side of my mouth, but the throbbing wraps itself around both the upper and lower right side like a very cantankerous retainer. Tomorrow afternoon, I go for a consult to see if there's enough of the broken tooth left to try to save it. At this point, I feel like a pregnant woman in her 40th hour of labor (which I actually have experience in) -- I just. want. it. out. So if the next post you see from me seems like it was written by someone under the influence of laughing gas, you'll know that at least my tooth doesn't hurt any more. 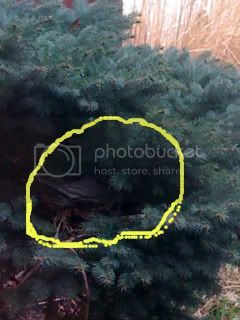 to be careful going in and out the front door, because a Mama Robin has built a nest about 3 feet from the door. And this was the nest at 8pm on Tuesday. Mama Robin sitting guard. When someone goes in or out of the door, the Mama Robin flies away to a nearby tree. If you're not watching, you might just walk right into her flight path. I don't understand why she leaves the nest, though. It seems like she'd sit very tight to be protective of her eggs. 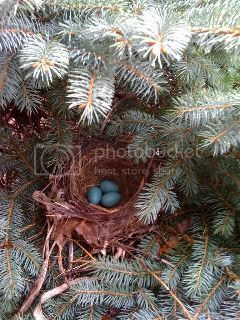 A quick search told us that the robin eggs should hatch in about 2 weeks. I hope they make it. I think it would be so cool see those little baby birds. It's Saturday night and we're all back together after being scattered across 3 cities last night. Mike and I had talked about going out for a date, but I thought it would be nice to all cocoon in the house together for family night. Good idea gone bad. First, we couldn't agree on dinner. Mike wanted to go out. Charlie and I wanted to stay in. Annie wanted to order in something. Great. Except we couldn't decide what to order in. She wanted 5 Guys. Mike wanted Chinese. I just wanted a bowl of cereal. So we declared it "whatever you want for dinner night" and left it at that. Next was the movie selection. Charlie wanted to watch professional wrestling on TV. Mike wanted Harry Potter and the Deathly Hallows. Robbie did not want to watch a "real people movie." I just wanted to come to a decision. We decided on Harry Potter, figuring Robbie would fall asleep shortly after the movie started. I called AT&T Uverse customer support to try to a.) get the video on demand working and b.) get our account credited for the rental. The nice woman on the other end of the phone was about the only bright spot in the evening. As she worked to test the lines and re-set the system (yes, Mike, I said go downstairs and check that TV. Really. Now. Just do it. ), Annie made herself some shrimp stir-fry and Robbie went to his room to draw pictures. Twenty minutes later, the account was credited, but the movie wasn't fixed. Charlie was arguing with me about still wanting to watch WWE. When he figured that was a lost cause, he went in the kitchen where he and Annie started to pick at each other. And that was the end of family night. I'd had enough, so I sent everyone to bed. Mike and I would just have our date night at home, I thought. Until he kept trying to find another movie to rent and I snapped that it would be a waste of another 20 minutes on the phone to get the money back when it didn't work and he snottily meowed at me like a pissy cat, so I stomped off and said, "I'm going to bed." As I said, family night FAIL. Usually I'm trying to tie up all my Friday Fragments at the last minute on Friday afternoon or Friday evening and am usually one of the last to jump in Mrs. 4444s Friday Fragments pool. Not today. Today, I'm posting my Friday Fragments on Thursday night! Why so punctual you ask, because tomorrow I'm on the road. Back up to Fort Wayne for a day-long tourism extravaganza. First stop, the Vera Bradley Outlet Sale. I have a few Vera Bradley pieces. Two -- a laptop bag and a rolling suitcase -- I bought myself. The others were given to me as gifts. But I'm really excited to go to this sale. Not so much for the deals (which are pretty blog-worthy -- a friend of mine went tonight and got an $85 bag for $28), but for the spectacle of it. It's like Black Friday shopping. I'm in it for the people watching and if I find some bargains along the way, even better. There was a time when I was quite crafty. I scrapbooked and stamped cards and made Christmas decorations. But that was before I had a job and kids who needed to be in 3 different places at one time. 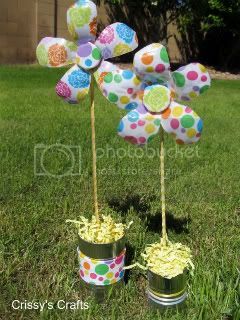 However, that old crafter in me was awakened when I saw this springy project, recycled water bottle flowers. I just might try this one or a garden full. 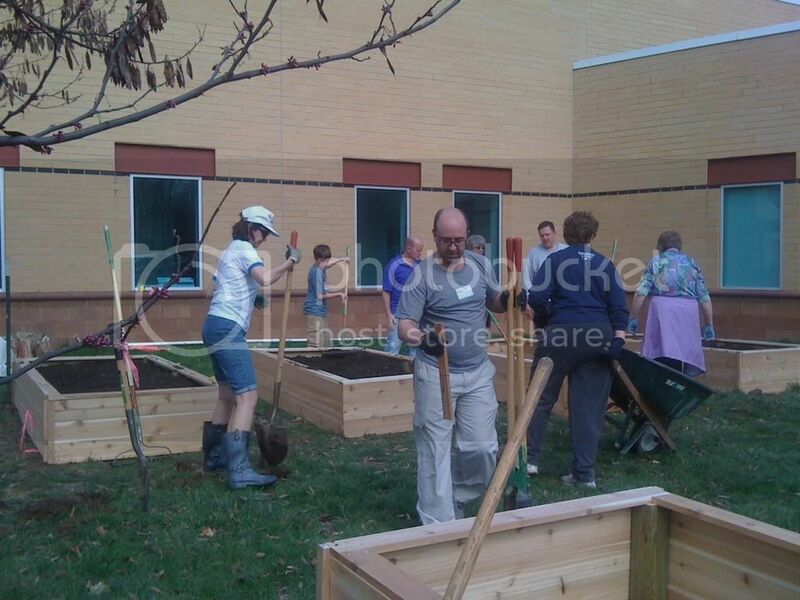 Speaking of garden -- we got the word that we're free to plant in the community garden. I can plant my lettuce now, but probably need to plant the cucumber, cilantro, tomatoes, peppers and sunflowers after Mother's Day. If you follow the 4th Frog on Facebook, you know that I really, really, really miss my couch. Only 9 more days. Would it be bad if I came home from church on Easter, plopped down on the couch and didn't move for, say, 6-8 hours? On Monday, I made a conscious decision to cut back on the carbs, drink fewer (1 or none) Diet Cokes, and eat lots of fresh fruits and veggies. I also was careful to go to bed at a decent hour. And you know what? I felt great! Last night, I fell asleep in the chair at 11:30pm and slept there for a couple hours before going up to bed. At work today, I succumbed to some brownies and a donut at the office. I had Diet Coke at lunch and at dinner. And you know what this time? I felt like crap. Sluggish, no energy. Ok folks, it's a busy day tomorrow and I'm trying to get back to that decent bedtime idea, so that's enough fragments from me. But if you haven't had your fill, stop by Mrs. 4444s' place for more Friday Fragments. a former college classmate, Brenda Bishop, asked if I would post an article about what some folks in her office are doing to support this year's race -- and the women in their office who are breast cancer survivors. For nearly 140 professors, staff and friends of the Kelley School of Business Indianapolis(located on the IUPUI campus), the central Indiana Race for the Cure is about more than raising money for breast cancer research and support services. It’s an opportunity to help carry the weight of a disease that punches you in the stomach and turns your life upside down. 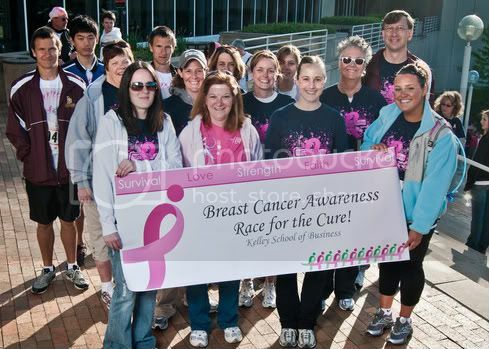 The 2011 Kelley Indianapolis team walks in honor of five faculty and staff members, including Barb Hassell and Angie Meyer, who are celebrating life and encouraging women of all ages to engage in breast health screenings. Race for the Cure is a platform for tens of thousands to make a difference; it’s also a celebration of faith, perseverance and life. Meyer, who is associate director of Kelley’s Career Planning Office, knows personally how fundraising through Race for the Cure impacts women and men diagnosed with breast cancer. Because of research conducted five years before her diagnosis, doctors discovered a better way to treat her kind of cancer. “Had I been diagnosed in 2004, it’s likely I would have had chemo in addition to surgery. It’s amazing how far breast cancer treatment is advancing because of research. Maybe in the next five years, a woman with breast cancer won’t have to endure surgery,” she says. By walking, by running or even by sleeping in for a cure, the Kelley School of Business Indianapolis is raising money and raising hope for breast cancer research and support services. If you've never participated in the Race for the Cure, I recommend going to see the Pink Parade of Survivors. Don't forget the Kleenex. If you aren't in Indianapolis, you can find a Race for the Cure in your area by clicking here. When the contestants were on their way to New Zealand, I felt so bad for Courtney that she didn't get to go. It it high time for the makeover episode. I can't appreciate Austin's weight loss because he looks so scroungy and please, oh, please someone cut Kailey's hair. She'd probably lose another 10 pounds just by shedding the Rapunzel 'do. Speaking of high, there is NO WAY in all that is good and just that I would ever, and I mean EVAH, jump off the top of that SkyTower or any other structure higher than 10 feet, no matter how many cables I was hooked up to. And why in the world weren't they wearing helmets for that? Is anyone else getting tired of Hannah's "look at the amazing me" routine? I must have had a fever and been delusional because I thought that 3k through the mountains and the sand dune and the beach looked like fun. Loved Ali's jacket at the weigh-in. Maybe I was too sleepy to notice, but this episode seemed to be sans product placement. That was a nice change. I know he asked to go, but I would not have voted for Moses to go home. He struggled at home when they went a few weeks ago and I think he's the one who really needed more time at the ranch, not Olivia. I'm having a hard time deciding on a favorite to win the whole thing. I hope Courtney wins the at home prize. But I think of the people who are left, most are either annoying or forgettable. No matter what she thinks, Cara will NEVER be a trainer on par with Bob and Jillian because they have never behaved as if their job on the ranch was about them. Cara wasn't upset about Kailey's gain for Kailey. She wasn't happy about Austin's and Ken's losses for them. She was invested in how her team did at the weigh only insofar as it reflected on her as a trainer. 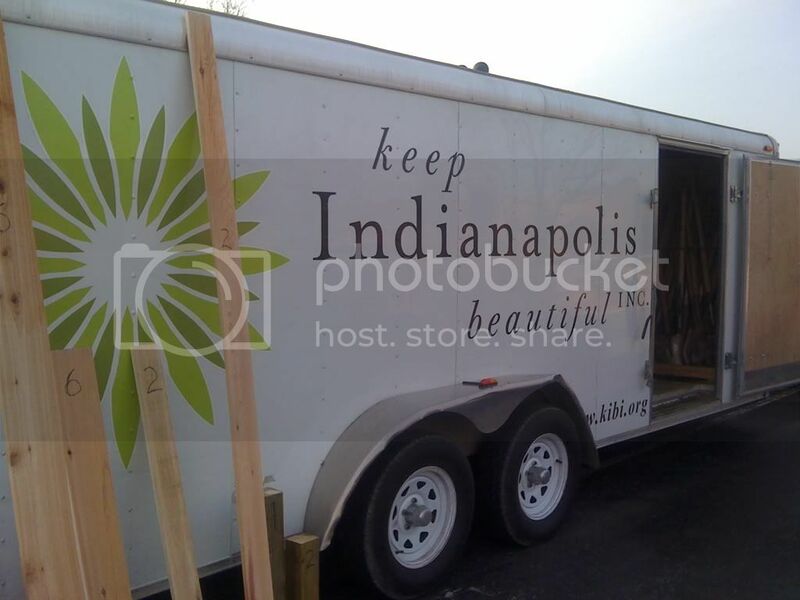 The good folks from Keep Indianapolis Beautiful were on hand to help guide us in how to put together the beds. I even did a little drilling -- until I stripped the screw and the drill bit. Then I re-assigned myself to soil (real gardeners don't call it dirt) duty. 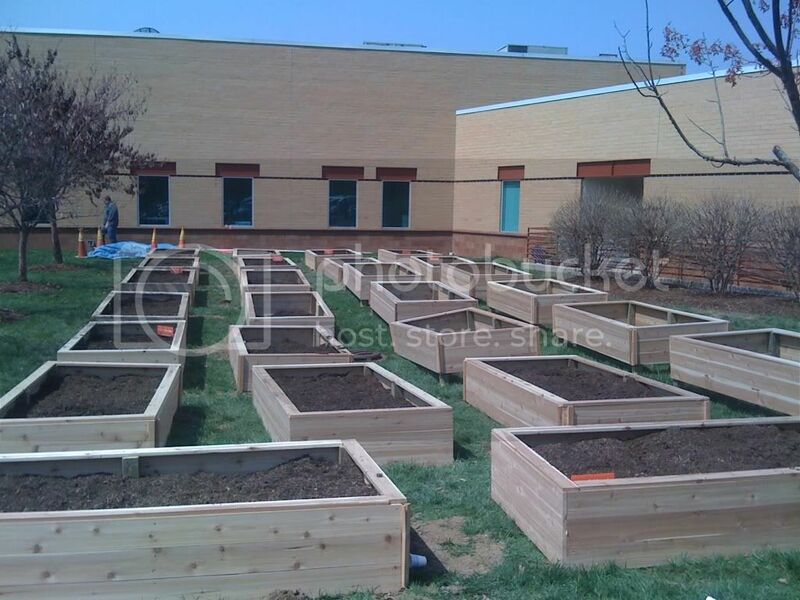 Before the beds could be filled, post holes had to be dug so the containers could be set down flush with the ground. 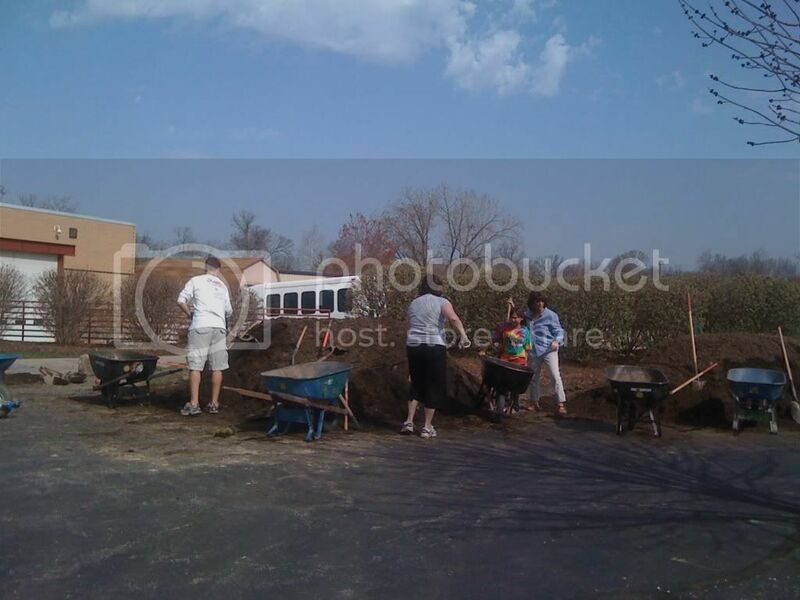 Each bed took probably 4-6 wheelbarrows full of dirt. This was really hard work. I will admit to hiding in the bathroom for a few minutes (ok, myabe 10) just to give my aching back a break. 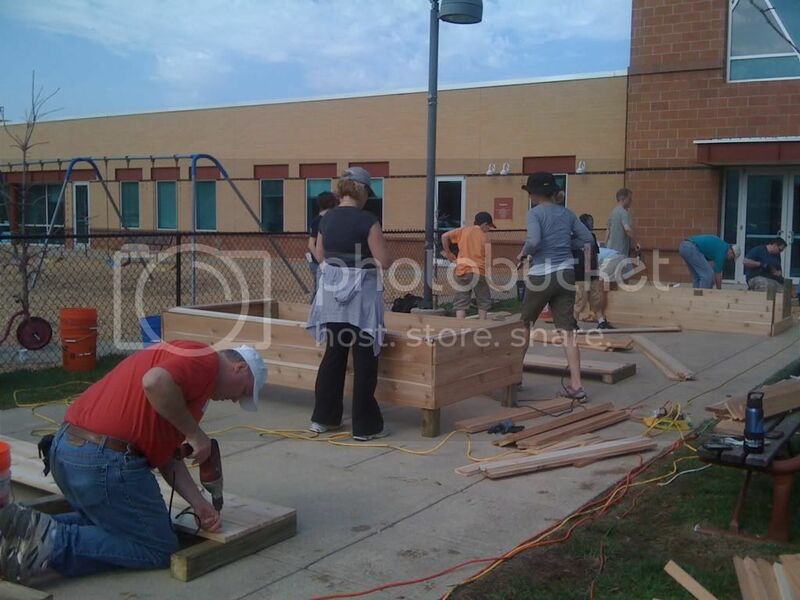 A little more than four hours after we started, all the containers were built. Thank goodness for some volunteers who will come on Thursday to finish setting the final ones in the ground and filling them with soil. Then the real fun begins! We plan to grow tomatoes, peppers, broccoli (if what we've started inside makes it), lettuce, radishes and sunflowers. Oh, and Annie wants zucchini. Will you garden this year? What do you plan to plant? Maybe it's the result of being in a Facebook culture where short & catchy rules. Maybe it's just the way my ear hears things. But lately, I've heard or read things and thought, "that would make a great bumper sticker." So I made them. Or at least pictures of them. 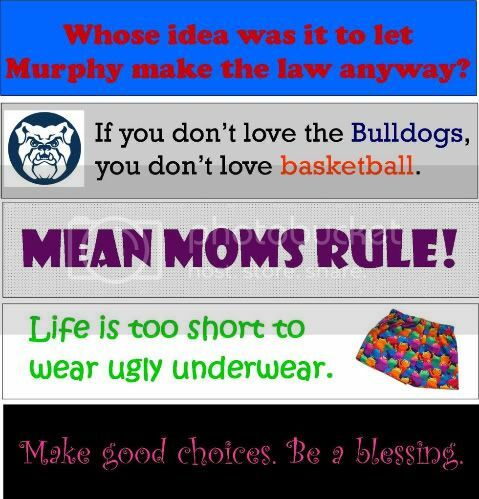 What would you put on a bumper sticker? I really need to get into the habit of writing my Friday Fragments throughout the week so I'm not so unfashionably late to Mrs. 4444s Friday Fragments party. Thank you all for your support regarding my mother-in-law's illness. I realized that I've never updated here. Although we had originally been told it was a matter of days, she is still with us, which has meant that Mike's been able to go spend several days with her and we'll probably all head down there again soon. Last weekend, we were given the same news about my grandmother. She is 87 years old and was hospitalized a bit unexpectedly. We thought she was going to go to a nursing home, but she took a turn for the worse, was largely unresponsive for several days and a transfer to hospice was arranged for last Monday. My uncle went in to see her on Monday morning, touched her arm and said "Mom, it's John." Boy was he shocked when she opened her eyes and plainly said "Well, hi John! How are you?" By that afternoon she was sitting up in a chair and eating yogurt. The above situations clearly indicate that the secret to immortality is being related to me! In the category of "just how dumb can people be?" -- On Monday, there were crazy thunderstorms in our area. I looked out my office window to see two men up on the roof of the 2-story house across the street, trying to lay down tarp. Crazy, I know, and you wouldn't find me up there in a thundering, lightning downpour, but I guess if they were trying to cover a leak I can understand. What I couldn't understand, when I looked out again a few minutes later, was that they had a KID up there with him. He was easily only 10 or 11 years old. On a two-story roof. In the rain. While thunder and lightning was all around. I wanted to call the police. Others in our office said it's not a crime to be an idiot parent. But if he had fallen off that roof and I did nothing, I would have been sick forever. So I called the non-emergency number. By the time the police got there to "check the child's welfare," all three were safely down, thank God. You know that big thunderstorm? Well, no one in the office wanted to go out for lunch on Monday (and I'd left mine sitting in the fridge at home), so we decided to order something in. We were thrilled to find out that the downtown Jimmy John's would deliver to us. Boy, did I feel awful when the delivery guy showed up. 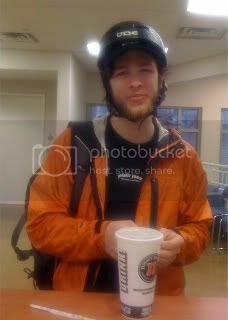 He had ridden his BIKE more than 2 miles in that storm to bring our lunch! If I'd known it was bike delivery, I never would have ordered. So some so-fast-it's-freaky props to Paul, sandwich deliverer extraordinaire! or worlds colliding or something like that. Planet 1: I told myself this morning as I was walking the dog, that now that the NCAA men's basketball tournament is over, I need to get re-committed to diet and exercise. No more sweet chili cha-cha chicken wings. No blue frosted cupcakes. No more Reese's peanut butter cups (which don't have anything to do with the tournament, except that my general disregard for good nutrition made it easier to eat those too). Planet 2: Tonight while driving Robbie to soccer practice (a whole other story by itself), I had to unbutton my jeans while I was driving. Oh. Yes. I. Did. Now, they did just come straight out of the dryer and we all know that jeans shrink a lot in the dryer and need some wearing to stretch them out. But I was afraid if I didn't unbutton them, the button would pop right off, ricochet off the steering wheel, hit me in the eye and blind me right there. Planet 3: Tonight on the Biggest Loser, Courtney was eliminated. I really thought she'd win it all. I don't get star struck very often. But ever since this season began, I have wanted to meet Courtney. She lost 100 pounds on her own before she ever made it on to the show. 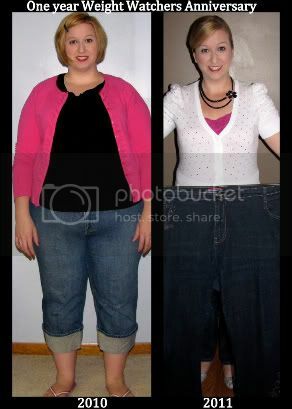 Now she's lost 215 pounds total! What I want to know is how has she maintained motivation? I've lost and gained again the same 30-40 pounds at least three times in the last 10 years. Why can't I lose it all, which would be about 70 pounds, and not find it again? Finding Courtney wouldn't be hard. Her family owns a Dairy Queen in Valparaiso, Indiana. But it seems kind of stalkerish to go up there and order a Dilly Bar with a side of heart-to-heart chat with Courtney. Actually, I'd like to meet her mom, too. She lost about as much as I need to and she's a mom with kids. So yeah, either one of them. Or both of them. We could chat over salads and Diet Coke. So maybe the end of a celebration plus the frustration of not being able to breathe in a pair of jeans plus inspiration from an unlikely source are just enough planetary alignment to get me back on track. The expectations were high. The execution was abysmal. 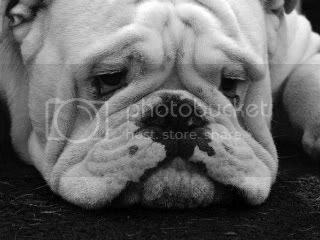 My Butler Bulldogs lost the national championship of college men's basketball last night. It took my breath away and left me, as a friend said on Facebook, feeling like someone just ran over my dog. I could go over all the plays and highlights, though there weren't many. I could talk about ifs and whys. I could point fingers at UConn's head coach and talk about NCAA sanctions for recruiting violations. But that won't change the outcome. I believed. I kept waiting for something to start the run, to unleash the magic the Bulldogs have brought game after game in this tournament. But last night, the dawg remained tethered. It was too much to watch the post-game. I turned to a DVRd cake show from the Food Network because cake always makes everything better. Finally, sometime after midnight, I crawled into bed, still in some shocked disbelief. Yet, this morning, I woke up and realized that I was still humming the Butler War Song in my head. No, my Bulldogs did not bring home a trophy last night. That stings and probably will for a while. But what will outlast the sting is the pride with which I can say I am a Butler graduate. Matt Howard, Shelvin Mack, Ronald Nored and the others. Coaches Brad Stevens and Matt Graves and the rest of the staff. The way they have competed, their focus on academics, their emphasis on team over individual, the grace and humility with which they seem to conduct themselves on and off the court. All that makes me proud to be a Butler Bulldog. Trophy or not. ... that God is crazy about you. God sends you fresh flowers every spring, a breathtaking sunrise every morning. If God had a wallet, your picture would be in it. If God has a refrigerator, your childhood scribbles would be on it. If God had the last cookie, He would give it to me. If God was Diet Coke, He would want me to drink Him up. If God had the remote control, He would let me choose the show to watch. If God was a color, He would be the sunniest, warmest yellow. My Facebook profile picture is still the green shamrock Butler picture I posted on March 17, the day Butler defeated Old Dominion. I'm wearing another piece of old Butler fan wear. I wanted a new shirt, but I haven't worn a new shirt for any game in this tournament. So I dug this one out of Mike's drawer. I just frosted sugar cookies with blue icing. In the win against Florida, it was blue frosted brownies. 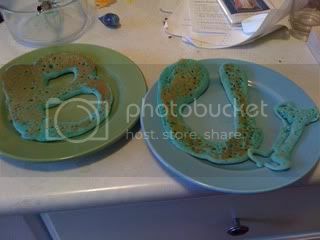 Over Wisconsin, it was blue BU pancakes. Mike is drinking his pre-game Diet Mountain Dew. Charles Barkley picked the Bulldogs' opponent...AGAIN. All the stars and superstitions are aligned for a Butler victory tonight. Woof woof! You bet I've got my Dawg on tonight! Robbie is a kid of happy extremes. When he loves something, he REALLY loves it. His first obsession was dinosaurs. From the time he was about 2 years old until he was around 6, he could not get enough dinosaurs. He knew their long and complicated names, which ones were meat eaters and which ones preferred leafy greens. He still likes dinos, but not at the level of obsession. The next object of his heart's desire was Legos. He could spend hours building Legos. Truthfully, I think that will bring him joy for a lifetime (if his dad is any indication). 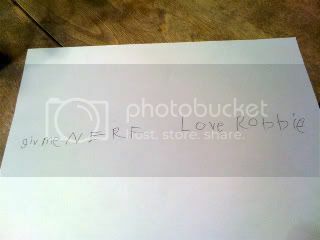 But Robbie's latest obsession is not dinosaurs or Legos. It's not drawing or painting, though both are certainly a big part of his waking hours. It's not riding his bike. Nope, what Robbie is REALLY into these days is BOX TOPS. It started because of a box tops collection contest at school. I didn't realize there was a contest going on until I came home and found little rectangles cut out of a few boxes of cereal in the pantry. Then I noticed Robbie going through the pantry and the fridge, inspecting every box and bottle, occasionally yelling out "BOX TOPS!" Of course, Mike then (because he's a nicer parent than I am) made sure to shop for box-top-bearing food the next time he was at the grocery store. Robbie has a baggie at home with 6 or 7 box tops in it, waiting to be turned in to his teacher after Spring Break. But he hit the motherload -- make that grandmotherload -- when we came to my parents' house for a visit yesterday. While Annie and Charlie went with my mom and dad to a volleyball game, Robbie and I headed back to their house for a little R&R. I asked him what he wanted for dinner. He said, "Cereal," and turned to open the pantry. "BOX TOPS! BOX TOPS!" It turns out that Grandma's pantry was well-stocked with box tops. I told him he had to wait until Grandma came home so he could ask her if he could cut out the box tops from packages of food that were still waiting to be eaten. When I told my mom about Robbie's discovery, she said "Oh, I have a whole box of box tops I've been collecting just because." 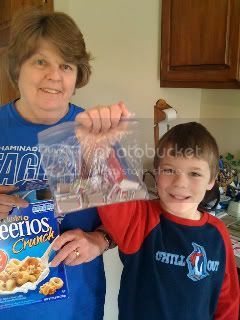 So this morning, Grandma rocked Robbie's world when she pulled out the box o' box tops and told him he could have them. Of course, when Grandma removes a box top, she does what most sane people do and just tears it out loosely. Robbie, however, is quite particular about the shape of his box tops. God bless my mom who sat there with Robbie and cut each box top into a perfect rectangle. They put all the box tops into a baggie and sealed it up for the trip home. Wanting to make sure to leave no box unturned, Robbie hunted through the fridge and the lazy Susan and turned up at least three more box tops Grandma somehow missed. We sorted the box tops into piles of 10 and counted Robbie's bounty. 133 box tops! He can't wait to take them to school on Monday. Thanks Grandma! It may be Spring Break, but I'm not missing the fragalicious party thrown every week by Mrs. 4444s. When you're finished here, click on the button below to join the fun with other folks who have frags to share. We're rockin' the staycation idea for Spring Break this year. It's been a good combo of out-of-the-ordinary fun, housework and sleep. Guess which I've enjoyed the most? On Monday, we took in Diary of a Wimpy Kid 2: Rodrick Rules. Cute, but not as cute as the first one. On Tuesday, I took the kids to a rally at the Indiana Statehouse. It was actually a work event. Annie was sure we were going to get arrested -- even after I told her it was an AARP rally. I think she was disappointed that it was so tame. After the rally, we went to the Rhythm Discovery Center, a place full of drums and cymbals and xylophones and gongs, which should seriously consider selling Advil in the gift shop. Wednesday was mostly a lazy day. Except that I folded about 4 loads of laundry and spent almost 5 hours at Panera Bread working on blog posts and other freelance articles. Ok, so maybe not so lazy. Yesterday, I had another video shoot for IN Shape Indiana. I think one more and we're finished. I'll let you know when they launch. Or you can sign up for their e-mail newsletter and get the video segments sent directly to your in-box. Then, we took the family out to Monster Mini Golf for a little glow in the dark links. Even though I have a self-professed disdain for miniature golf, we had great time, even if (or maybe because) a few of us fudged our scores a bit. Now it's Friday and I'm already a little sad about the return of school and work. 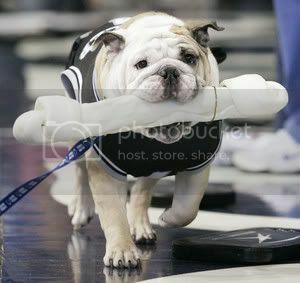 But if my Butler Bulldogs win the big game tomorrow, everything will be a whole lot brighter.